Unbreakable ABS body with polycarbonate lens. 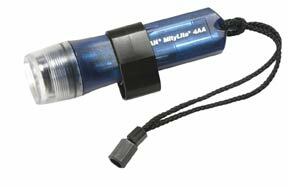 Features a pre-focused Xenon lamp with an unsurpassed white collimated light beam. Multi-function mounting clip (hard hats and dive mask straps), adjustable black lanyard, foam line battery contact and 4AA batteries. Submersible to 250 feet. YES 31.5 3.66 10,000 4AA 3.5 hours 6" 0.512 lbs.